Editor’s Note: Educationist Ali Bakorda is well known in Kenya’s northern regions as well as in the national education fraternity. Hailing from a family that did not even own a hen to hatch an egg to sell in the market, the man many knew as “Abakurde”, encountered tough trials and tribulations until he finally climbed the ladder of success through self-motivation and pedagogical transformation. A friendly man who is full of humor, Abakurde would jokingly claim to his Somali friends that he exclusively owned a small village within Garissa County called ‘Kurde’! In an interview with our own Adan Makina, Ali A. Bakorda gives our readers paradigmatic information related to education in the Somali-populated Kenya’s northern regions. Other than teaching, managing, and administering a large institution, Bakorda did many other fascinating tasks in his spare time. We hope you enjoy the interview. WardheerNews (WDN): Welcome to WardheerNews. Before we begin our interview, please tell us briefly your background history such as the environment you grew up in, schools attended, and academic achievement(s). Ali: My past is turbulent. I had grown up in a very poor family that did not own even a hen! What disturbs me most is that when I passed Kenya African Preliminary Education (KAPE) with eight others in a class of 26, only nine of us passed. But there was no secondary school in the whole province. One had to go to Shimo la Tewa in Mombasa to pursue secondary education. I was not able to make it because of poverty! That hurts me to date! And that’s how I joined the teaching profession having been pushed into it by my late mentor and teacher Mr. A. A. El-Amaawy. He passed away last year. May Allah reward him with Jannatul Firdaus, Aamiin. So I taught in primary schools and as time went by I did London General Certificate of Education (LGCE) exams ‘O’ and ‘A’ levels and ploughed my way up till 1994 when I voluntarily retired. I was born to Yemeni parents in Wajir. Astonished at my fluency of the Somali language, time and again, I’ve been asked by Somalis if my maternal uncles were Ogaden, Ajuran, or Degodia– three Somali clans that have a heavy presence in historic Wajir. WDN: How old were you when you joined the teaching profession and to which school were you posted first? Ali: I joined teaching at age 21. Almost all my teaching career was in Wajir. WDN: What inspired you to jump onto the educational bandwagon and what were the main horrifying factors you perceived as deserving significant attention before becoming an Educationist? 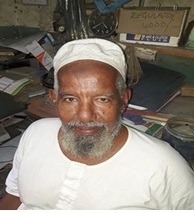 Ali: I was actually pushed into teaching by my teacher and mentor the late A.A. Elmaawy who knew I came from a very poor family as such, I had no forethought as to the task ahead. All I believed was teaching was a noble profession. WDN: Having traveled the breadth and width of Kenya whether to attend seminars, conventions, or for further training, what disparities did you perceive in other regions that Somali schools lacked? Ali: Well this section deserves a chapter to be fair to it. In short the Somali is a staunch Muslim who had alot of misgivings about secular education. But things have changed now as they have plunged into it full scale and doing well. WDN: We learn from history that before Kenya became independent, especially during the colonial era, majority of the teachers in the Somali-dominated areas or regions were exclusively Zanzibari teachers. If true, why were the Zanzibari teachers selected by the British colonial Administration? Was it a form of divide-and-rule tactics? Ali: The early teachers came from Zanzibar as a colonial strategy to have the Somali acceptance of schools. They brought the late Shariff Shibly who started Garissa primary in 1947 and moved on to Wajir in 1948 and started Government African School in Wajir. WDN: Can you tell us about the roles and responsibilities you held during your tenure in the educational sector and how long have you been in the education sector? Ali: I started as a teacher in 1966 and retired as an Assistant Director of Education (P.E.O.) in 1994. So I have been teacher inspector DEO and Provincial Director as well. I never taught in Garissa but Wajir. I have been in the Education Sector from 1966 to 1994 when I voluntarily retired. WDN: How many local ethnic Somali District Education Officers (DEOs) and Provincial Education Officers (PEOs) in the northern regions can you recall for the time you were in employment? Ali: The first local officers after late Omar Sheikh Farah were Ibrahim Hussein and myself. WDN: Since gaining independence from Britain in 1963, the northern regions you served (formerly part of the North Eastern Province or NEP) has been afflicted by an atmosphere of neglect and abandonment, and dwindling education. What are the best strategies for tackling these insurmountable problems? Ali: Neglect for the whole province was applied by the British against the Muslims and the shifta menace added insult to injury. The vast area and small population that was compounded to a barren land also affected the area. WDN: Compared to other counties, the literacy rate of the counties (previously provinces) you served reveal grim statistics. Girl-child education is at the lowest ebb. Most affected are the rural areas where girls ‘primary responsibilities include herding goats and sheep or doing backbreaking house chores from dawn to dusk. What do you think can be done to overturn these trends? Ali: As for the results and education development time is not on our side. Compare Kagumo secondary that started in 1900 and Wajir secondary that started in 1963! That tells a lot doesn’t it? I remember the first two girls were Rukia Ali and Fatima Idhow. The trend has now drastically changed. Girls equal boys or more in some classes. WDN: It has come to our attention that you have been a guitarist in the past and that you taught world renowned Afan-Boran Vocalist and Guitarist Malfadho (May Allaah Admit him to Jannatul Firdows). Tell us more about how you came to learn the Oud, and the number of people who benefited from your musicological talent. Ali: As for my musical stint, in short, we bought the instrument from Malindi, learned how to play it together with Salim Mubarak who is still alive. As for the late Malfadho, he was very keen to learn music. He used to work in Wajir hospital. After work he would pass at my residence and learn to play the Oud though he would compose music in his own vernacular afterwards. Honestly, I gave Malfadho the main tools for the ABCD of music. WDN: You were the first non-Somali pedagogue to have written a book in Somali? If so, what was/were the name(s) of your book(s)? WDN: To elevate the educational standards of the regions you previously served, what is the last advise you have for the people and the educational/political leaders that currently hold the mantle? Ali: My advice to all is…we started late so let’s not leave any stone unturned so as to catch up with the others. Alhamdu Lillaah, we have done well so far but the journey is still long. WDN: We appreciate for giving us your precious time. Ali: Thank you Sheikh Adan Makina and your team at WardheerNews.